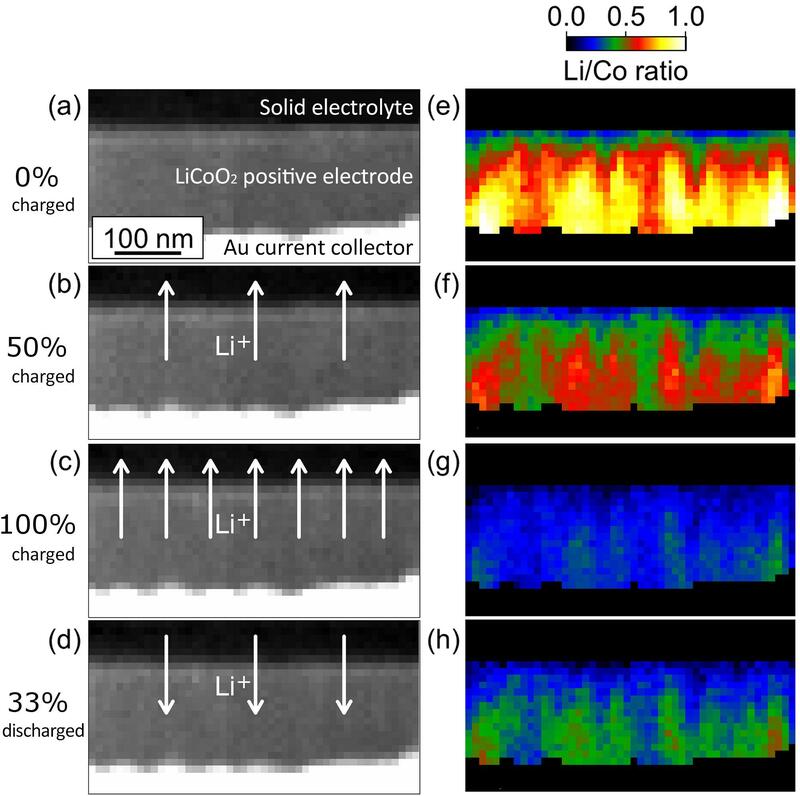 Through this observation, it became clear that ununiformly distributed Li in the LiCoO2 cathode had effects also on movement of the Li-ions during the charging and discharging processes. It was also found that the Li-ion concentration was low and lots of Co3O4 coexisted around the interface near the solid electrolyte. It is hoped that this will make clear the cause of the Li-ions' high transport resistance at the interface and lead to a big step toward commercialization of the next-generation batteries. This achievement was reported in the online edition of the journal "Nano Letters" on August 21, 2018. This study was conducted supported by the Japan Society for the Promotion of Science's Grants-in-Aid for Scientific Research (JP 17H02792) and the Ministry of Education, Culture, Sports, Science and Technology's Nanotechnology Platform Program (Nagoya University). STEM images showing the cross-sectional images around the solid electrolyte / LiCoO2 cathode / Au current collector when the battery is charged by 0% (before charging), charged by 50%, changed by 100% and discharged by 33% respectively. (e) through (h) show the Li distribution in the fixed region mapped by using the EELS and the advanced image analysis. They show that the ion concentration is low around the interface near the solid electrolyte. They also show that the Li-ions are desorbed from the LiCoO2 cathode and concentration is reduced as the charge amount increases and, in the discharging process when the Li-ions returns, the ion concentration increases from the area near the Au current collector. Research and development of the all-solid-state Li-ion batteries that can be expected to realize high safety and high energy density are being conducted around the world as one of the "innovative batteries" that can solve the issues of the conventional batteries using the liquid electrolyte for the purpose of their future installation on the electric automobiles and the hybrid cars. However, the Li-ions' very high transport resistance at the interface between the electrode and the solid electrolyte is preventing commercialization of all-solid-state Li-ion batteries. What is necessary to solve the issue and design and develop the high-performance all-solid-state batteries is visualizing the movement of the Li-ions in the batteries and feeding back into the battery designing. However, because of the batteries' reactions generated locoregionally in the nanometer (one-billionth of a meter) scale and low detection sensitivity of Li, a light element, the nanoscale movement of the Li-ions during the charging and discharging processes could not have been visualized. Applying the Japan Fine Ceramics Center's operando monitoring techniques (*3) to Panasonic's battery technologies enabled measuring the two-dimensional energy loss spectrum by using the electron energy-loss spectroscopy (EELS) while charging and discharging the batteries. As the spectrum contains signals caused by Li, Panasonic used the advanced image analysis techniques (multivariate analysis techniques) and succeeded in capturing clearly the weak Li signals in nanometer scale. 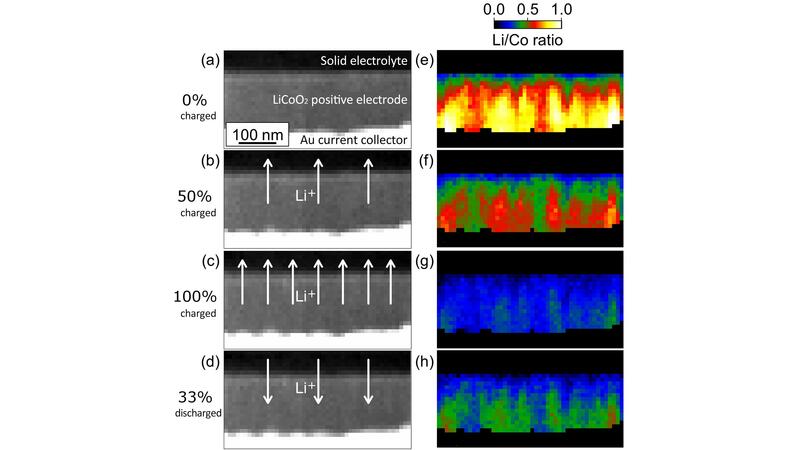 By using this new Li imaging technique, the Li distribution inside the LiCoO2 cathode and the valence distribution of the transition element Co were monitored two-dimensionally while charging and discharging the all-solid-state Li-ion battery consisting of the LiCoO2 cathode, the LASGTP solid electrolyte (*4) and the in-situ formed negative electrode (*5). The technique enabled capturing clearly the Li-ions' extraction and insertion according to the battery's charging and discharging and it became clear as a result of the advanced image analysis that co-existence of lots of Co3O4 near the interface between the LiCoO2 cathode and the LASGTP solid electrolyte was preventing smooth movement of the Li-ions. Designing the batteries with reduced Li-ion interface resistance will be possible by feeding back this monitoring results into the all-solid-state battery designing process. As a result, the ultrahigh-performance all-solid-state batteries where the Li-ions can move smoothly can be realized. In addition, as the STEM-EELS measurement and advanced image analysis techniques having been developed this time can also be applied to the other secondary batteries (such as the all-solid-state lithium ion batteries using the sulfide solid electrolyte, the sodium ion, the magnesium-ion, etc. ), a huge contribution to commercialization of various types of the all-solid-state batteries can be expected. Title: "Quantitative Operando Visualization of Electrochemical Reactions and Li Ions in All-Solid-State Batteries by STEM-EELS with Hyperspectral Image Analyses"
The electron microscope that detects scattered transmitted electrons and produces images by scanning two-dimensionally the surface of a sample with a beam of electrons narrowed to 0.1nm order. It can be used for evaluation and analysis of the locoregional atomic structure. The method that enables analyzing the state of elements and electrons in the material by measuring the energy that is lost when electrons transmit the inside of a sample. It is a monitoring technique that is effective for detection of the light elements such as lithium. The technique to monitor with the electron microscope while charging and discharging a battery. It enables monitoring the chemical reactions, etc. under the condition that is closer to the actual state. The word "operando" is a Latin word for "operating." The Li-ion conductor mainly consisting of LiTi2(PO4)3. It is the polycrystalline material with appropriately doped Si, Ge, Al, etc. for improving the Li-ion conduction. The negative electrode material that is formed by inserting a large amount of Li-ions into the LASGTP solid electrolyte and decomposing the solid electrolyte. It was found by Nagoya University's Professor Yasutoshi Iriyama (incumbent) in 2006.